The Semantic Media Wiki is Wikipedia's full-fledged framework, in conjunction with many spinoff extensions, that can turn a wiki into a powerful and flexible “collaborative database”. All data created within SMW can easily be published via the Semantic Web, allowing other systems to use this data seamlessly. New York Times' Linked Open Data provides 10,000 subject headings as linked open data under a CCBY license. They also provide both RDF documents and a human-friendly HTML versions.The data records can be downloaded as an SKOS file here. An interesting visual display of a semantic sites on the web. RDF DATASET: Click on the blank screen to begin seeing the linked open data. 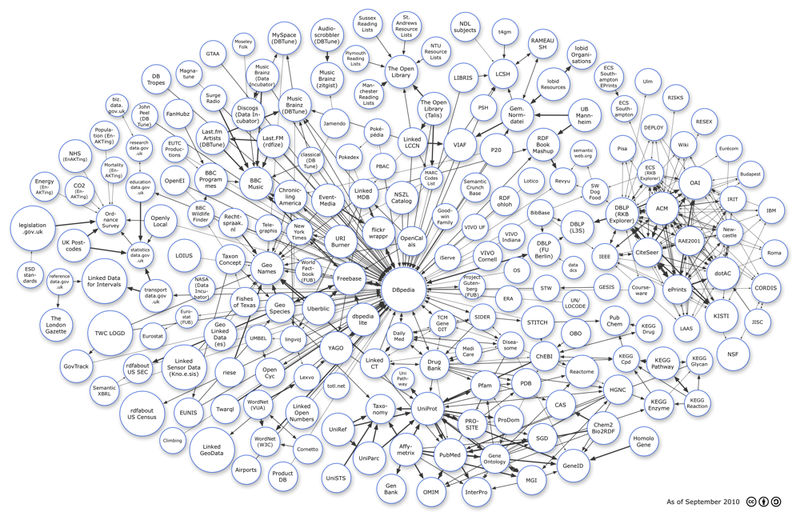 The Linked Open Data Diagram Linked Open Data: Clicking on the circle node takes you directly to the site. DBpedia: DBpedia is a community effort to extract structured information from Wikipedia and to make this information available on the Web. DBpedia allows you to ask sophisticated queries against Wikipedia, and to link other data sets on the Web to Wikipedia data. We hope this will make it easier for the amazing amount of information in Wikipedia to be used in new and interesting ways, and that it might inspire new mechanisms for navigating, linking and improving the encyclopaedia itself. DBLP Bibliography: It publishes a Bibliographic Database where data are interlinked. Anyone can also list their names and publications according to a prescribed format. Geonames: The GeoNames geographical database covers all countries and contains over eight million placenames that are available for download free of charge. Revyu: is a web site where you can review and rate things. Unlike many other reviewing sites on the web, Revyu.com lets you review and rate absolutely anything you can name. Umbel: a lightweight reference structure of 20,000 subject concept classes and their relationships derived from OpenCyc, which can act as binding classes to external data; also has links to 1.5 million named entities from DBpedia and YAGO. It works on the Vocabulary and Reference Concept Ontology (namespace: umbel). UMBEL is the Upper Mapping and Binding Exchange Layer, designed to help content interoperate on the Web. riese: The riese (RDFizing and Interlinking the EuroStat Data Set Effort) started out in mid 2007 as an initiative in the W3C SWEO Linking Open Data community project. Sensorpedia: Sensorpedia is a program initiated by Oak Ridge National Laboratory (ORNL) to utilize Web 2.0 social networking principles to organize and provide access to online sensor network data and related data sets. It makes it easy to share sensor data. FOAF: The Friend of a Friend (FOAF) project is creating a Web of machine-readable pages describing people, the links between them and the things they create and do; it is a contribution to the linked information system known as the Web. OpenPSI: a community effort to create UK government linked data service that supports research. VIAF or Virtual International Authority File: VIAF is an aggregation of authority files (author names) from national libraries from around the world. It is a joint project of several national libraries, implemented and hosted by OCLC. The project's goal is to lower the cost and increase the utility of library authority files by matching and linking the authority files of national libraries, and then making that information available on the Web. Linked Data Open Community More resources on Linked Data can be found at this site. Linked Data: Linked Data Distributed accross the web. This page was last modified on 9 December 2010, at 22:14. This page has been accessed 5,768 times.